Is it Safe to Run Space Heaters All Night? Although modern heaters have safety features built in, you should never leave a space heater running overnight. Whether your heater runs on gas or electricity, it houses an element that gets hot enough to start a fire, and that's a good reason to turn it off at night. A typical electric heater draws 1,500 watts of electricity, and that much electricity heats the wires through which it flows. If you have older wiring that can't handle the heat, a fire could start behind the walls, and you may be none the wiser until it's too late. Even if you have good wiring, or you use a gas heater, you should turn off a space heater at night. According to the National Fire Protection Association, heating malfunctions are the second leading cause of home fires in the United States. When a heater failure starts a home fire, the culprit is a space heater 40 percent of the time. This translates into 25,000 residential fires a year involving a space heater. 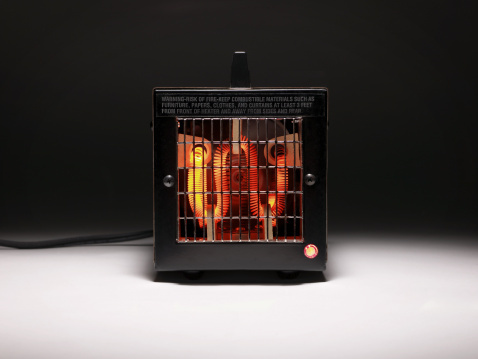 Half of all space heater fires start because something gets too close to the heater and ignites. In addition, older units without safety shutoff devices can start a fire if they tip over, and energy-hungry units can overheat old wiring improperly protected by out-of-date breakers or fuses. If a fire starts while you're asleep, you may wake to find your escape route blocked. Owners of conventional and catalytic gas heaters need to worry about carbon monoxide, which is released as a result of incomplete combustion. Carbon monoxide is odorless and colorless, and by the time the levels are high enough to set off the alarm, you may have already inhaled a harmful dose -- especially if you've slept through the early warning signs of carbon monoxide poisoning. The safest choice is to turn off your heater when you go to bed. Install smoke alarms throughout the house, and clean the sensors regularly with compressed air. Never run propane, natural gas or catalytic heaters unless you have working carbon monoxide detectors. Plug your electric heaters directly into the wall. Don't rely on extension cords, which can overheat. Place a free-standing heater on the floor -- never on a table or chair from which it can tumble. Even if it shuts off, the element is still hot and can ignite anything it comes in contact with. Keep forced air, radiant and gas heaters at least 3 feet away from flammable materials, including the walls. Oil heaters and those with infrared bulbs can be placed within a foot of the walls, but never allow them to be in direct contact with anything other than the surface on which they stand. Inspect any electric heater for damage if it trips the circuit breaker or a ground-fault circuit interrupter outlet. Don't assume a faulty breaker or outlet.